I recently performed an appraisal of a major collection (750 volumes) of 19th century author, Horatio Alger, of popular juvenile books. The largest and most significant collection of an important social impactor that I have ever encountered. If not a complete collection of a prolific author’s entire output, it is very close. It was compiled over decades with individual purchases. This collection has been donated to the Redwood Library and Athenaeum in Newport, RI. Alger’s books were extremely popular and were often reprinted by a various number of publishers which can create a bibliographic nightmare in trying to determine the printing history of many titles. Alger also had an important impact on the defense of unfettered capitalism. Government intervention in the market was not needed because of “rugged individualism.” Alger’s “rags to riches” mantra, coupled with “luck and pluck” reinforced the late 19th century concept of individualism and laissez faire economics. Alger was very prolific over five decades. Bennett, Bob. Horatio Alger – A Comprehensive Bibliography, 1980. 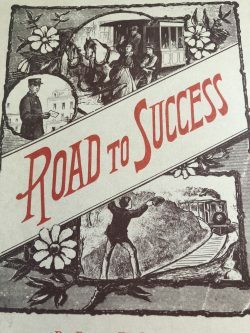 Gardner, Ralph D. Road to Success – the Bibliography of the works of Horatio Alger, 1991 revised.